HMB is a highly marketed supplement that’s received a lot of hype in recent years. Specifically a newer version called HMB-FA which stands for HMB-Free Acid. Currently, only Muscletech has licensed HMB-FA or “BetaTOR”. This popular workout supplement was first marketed in the 90’s but the 90’s were the hay days of “proprietary blends” and pretty much a predominant “I’ll try it” gym culture. It eventually lost it’s spotlight time due to lack of published research and conclusive studies. The Free-Acid form specifically is also trademarked as “BetaTOR” and currently found in Muscletech’s much hyped “Clear Muscle”, a new HMB-FA supplement we’re looking forward to reviewing in the future. There’s even a “Team BetaTOR” …seriously, check it out here. But to understand Clear Muscle, BetaTOR and HMB-FA we first have to understand what regular regular old-fashioned HMB is. So What Is This Beta All About Bro? HMB is an abbreviation for beta-hydroxy-beta-methylbutyrate, which is itself a byproduct of leucine. Yes that leucine, that beautiful amino acid you’ve been taking your whole life. Even though it’s marketed as such, the overall benefits of HMB are not limited to performance athletes. This popular pre-workout ingredient been proven to aid others who need more muscle integrity. It is most beneficial when taken just before (60-90 minutes in regular form, 20-30 minutes in Free Acid form) or after an exercise session. Even if not combined with exercise, it has been shown to help improve muscle health. Unlike many muscle building supplements, it also appears to be safe for long-term use. But before you go blowing all of your hard earned cash know that HMB does not appear to be more effective than its parent leucine when taken alone. However, when used with other amino acids, it does seem to support better growth and absorption, which is an overall net positive and a good reason to mix it in with your regular PWO or intraworkout. 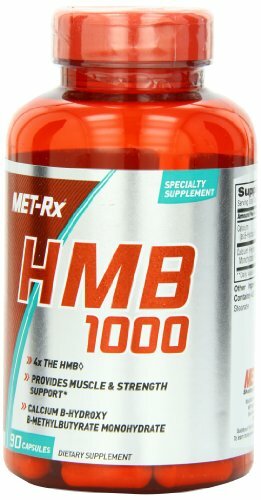 Maximum Strength HMB (ß-Hydroxy ß-methylbutyrate) 1000mg Per Serving, 180 Capsules. Highest Potency . 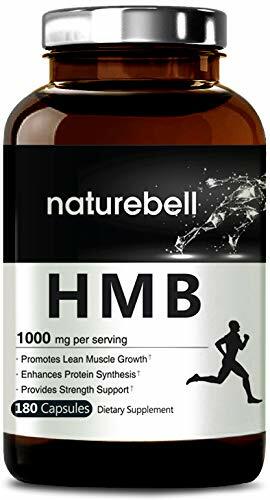 Supports Lean Muscle Mass: HMB is a naturally occurring substance that supports the addition of new muscle mass and prevention of muscle breakdown. Supports Strength & Stamina: Supports production of proteins to strengthen muscles, stamina and prevention of skeletal muscle damage. What else is it good for? Well it may help to metabolize cholesterol. There is still a lot that is not known about this compound and studies have not been conclusive enough to determine exactly how much of a benefit HMB can provide. The studies that have been done have shown the following promising results: an increase in lean muscle mass when combined with an intense exercise program and quicker muscle recovery. It also helps to reduce blood cholesterol levels and prevent muscle catabolism when used in efficacious doses and over an extended period of time. Muscle catabolism is a buildup of carbon dioxide, lactic acid, urea and ammonia waste in muscle tissue. HMB can help stimulate the body to remove these substances. By reducing muscle catabolism this compound can effectively help the body to lose fat (burned instead of muscle) and preserve/build more muscle. This makes it a killer supplement to include before workouts, even if you are just doing cardio, to help preserve that hard-earned muscle mass. These two popular supplement ingredients go together like peanut butter and jelly. HMB particularly seems to be most effective for developing muscle strength and mass when combined with creatine, one of the most studied and confirmed-effective supplements money can buy. This means the results are pretty much guaranteed as they’ve been replicated in controlled studies AND these same studies also ensure the safety of the chemcial over long periods of time. Generally, muscle cells do not live very long, especially when they’re getting the sh*t beat out of them at the gym. HMB promotes a longer life span for protein saving cells from exercise-incurred damage. By consuming more protein, you can also increase the amount of naturally occurring levels HMB (remember, it is a leucine metabolite, so you’ll convert some of it naturally even without supplementation) available within your body. Even though HMB is a byproduct of leucine, taking leucine directly does not provide the same results or same blood levels of pure HMB or HMB-FA supplemented directly. This is because most of the ingested leucine is metabolized and therefore less total volumes of available HMB is produced. Adding pure HMB also maximizes oxygen metabolism during workouts which has the handy benefit of extending muscle endurance. Can I Get It From Whole Foods or MUST I Supplement? Because HMB is a byproduct of leucine, it can be metabolized by the body when eating beans, chicken, nuts, fish, refined dairy products like cheese, alfalfa, grapefruit, and red meat. However, because food must be metabolized, a it’s hard to obtain a large quantity through eating whole foods. In this case, if other main dietary bases are covered, a supplement may be worth considering. HMB actually has it’s own website that provides all the details of the studies conducted by both the inventors and manufacturers. As most studies performed by the manufacturers of a supplement tend to have a favorable bias for the product the information provided should be weighed against studies done by independent researchers. As highlighted above, this chemical is extremely safe as it has incorporated research from studies done since 1955 on amino acids, leutine, and combinations of amino acids that aid in the performance enhancement for professional athletes. Although obviously favorably biased the studies are extensive and detailed. So while they should be taken with a grain of salt they also shouldn’t be laughed off. More studies specifically trying to find negative side effects and maximum healthy consumption need to be done to give this supplement a greater positive reputation and more credibility within the bodybuilding/weightlifting community. Leucine produces HMB as a byproduct. Leucine is the substance in the body that stimulates the production of muscle and is an amino acid. It is also used in the production of many medications, both over the counter and prescription. Because of all of its benefits Leucine is one of the common components found in most BCAA supplements. Great Science Steve Urkel, But Does It Really Work? Well, that’s really why your reading this isn’t it, you’re considering purchasing it to boost your gains. At first glance, it appears it very well might not be worth the money. Go-to performance supplement and chemical site Examine.com isn’t exactly singing HMB’s praises, but they’re also not as negative as they are with a lot of other supplements. HMB is an active metabolite of Leucine that reduces muscle protein breakdown. It appears to have an anti-catabolic role for muscle, but fails to be more effective than its parent amino acid for inducing muscle protein synthesis. And that’s the key thing to pull out of this, that overall it seems this chemical is better for retaining muscle and preventing breakdown than it is for actually creating or “synthesizing” new muscle. In summary then, HMB is anti-catabolic but not anabolic. This means it’s primarily a “cutting” supplement compared to a “bulking” type of supplement. But Examine is not the end-all-be-all authority and there have been other studies that have shown HMB-FA (which is the “Free Acid” form of the chemical) supplementation to actually aid in building new muscle while also reducing body fat percentages. The above is from one of the most impressive studies done on the supplementation of HMB-FA on performance individuals. You can read the original study here. Be prepared to be blown away as it seems the free acid form isn’t just anti-catabolic but is actually anabolic as f*ck! These results suggest that HMB-FA enhances hypertrophy, strength, and power following chronic resistance training, and prevents decrements in performance following the overreaching. The free-acid (FA) form can only be found in it’s patented “Beta-Tor” form, which is currently only available in Muscletech products like Clear Muscle. So according to studies, the non-free-acid form seems to be a great supplement if your planning on cutting but want to maintain as much lean muscle mass as possible while reducing your overall body fat percentage. Additionally the free acid form seems to be perfect for individuals looking to actually gain new muscle or who are in a “bulking” phase. 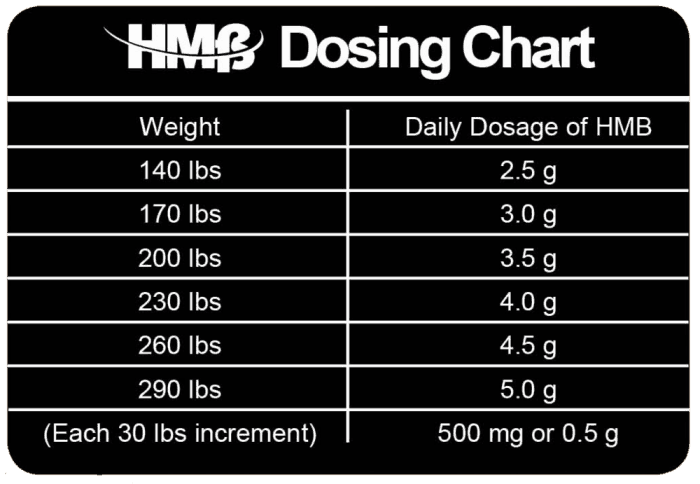 The normal recommended dosage of HMB is 38 mg per kg of body weight or about 84 mg per pound. Supplements are commonly bonded to calcium and is also available in free form, such as Beta-Tor. Three grams a day for most people over a period of approximately eight weeks is generally considered the safe dosage level. The main benefits are found during the workout, so it’s not ideal for all-day, long-term use, although there are no known side effects with either long-term or short-term usage. The best combination of nutrients and best dosages in the HMB supplement has not yet been officially determined but because of safety you can experiment yourself to find what amount are most effective. An important use for HMB is in the elderly population. As a person ages they lose muscle mass which causes related health and posture issues. It can help the elderly keep developing their muscles from age and is also used to improve muscle recover because of injury and illness. There have been some positive results when used by persons with AIDS in preventing muscle destruction. For those individuals who take medication to lower their blood pressure, they should note that HMB is credited for lowering blood pressure, and consequently, those individuals may need to lower their dosages of blood pressure medication. As always, consult with your physician. This versatile supplement also has a positive result for use with cardiovascular diseases. It is also used to treat high blood pressure and high cholesterol. IT can help prevent drastic weight loss and diarrhea in people with AIDS. It can also have a positive effect on the immune system for AIDS patients. Researchers are still not sure of exactly how the chemical breakdown and utilization process works, but have made detailed notes on the results of its usage in many different kinds of case and in performance athletics. The supplement also has the potential to help eliminate bacteria from the body through the strengthening and improvement of the immune system. This shows that it works with several systems in the body, not just those that promote muscle growth. HMB is a patented product for use as a sports supplement whose use license is licensed by ISURF to MTI [Metabolic Technologies, Inc.]. The actual patent for the supplement is owned by Iowa State University Research Foundation [ISURF]. The current patent number of: 4,992,470, 5,348,979, 5360,613, or 6,031,000 will be on the label is the product is the real HMB. Since the supplement is primarily used by bodybuilders many products combine HMB with creatine, whey protein, and glutamine. There’s only one company that sells the most potent form, the Free Acid form. This single company is none other than Muscletech and the product containing pure HMB-FA is called Clear Muscle. It ain’t cheap but the results are impressive enough to give it a try. If Clear Muscle is out of your price range but you’re still planning a cut phase and want to preserve as much of your muscle mass as possible (fight catabolism) then you might want to go with a much more affordable calcium-bonded form. These pills are much cheaper and thus can be consumed in recommended quantities without breaking the bank. Optimum Nutrition is known throughout the bodybuilding community as the gold standard in supplements, not just because of their Gold Standard whey protein but because their entire range is known for consistent quality at affordable pricing points. 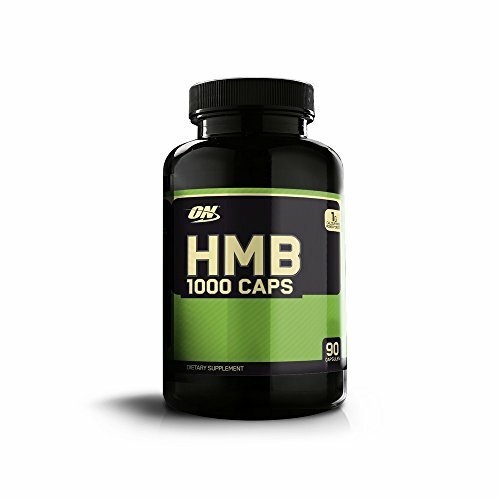 Optimum Nutrition’s HMB is probably the best bang for your buck. Beta-hydroxy-beta-methylbutyrate, B-Hydroxy B-Methylbutyrate Monohydreate, Beta-Hydroxy-Beta-Methylbutyric Acid, Calcium B-Hydroxy B-Methylbutyrate Monohydrate, Calcium HMB, Hidroximetilbutirato, HMB de Calcium, Hydroxyméthylbutyrate, Hydroxymethyl Butyrate, Hydroxyméthyl Butyrate.